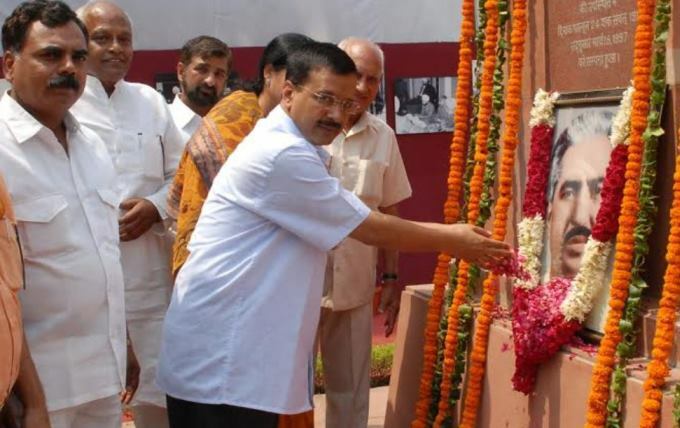 Chief Minister of Delhi Arvind Kejriwal paying his respects to the first Chief Minister of Delhi Ch. Braham Prakash. There has always been a strain in the Centre-States relationship in India owing to our Quasi-Federal structure and the multi-party system we have. At any given time, there are usually two different parties in power at the Center and State levels. This makes things a little complicated, as we are witnessing in the case of the NCT of Delhi today. The tiff between the Hon’ble LG Najeeb Jung and the Chief Minister of Delhi Arvind Kejriwal started as soon as the latter took up the office. For the Delhi Government, it became logical to claim that having LG as the chief administrator practically means a permanent President’s Rule in ‘Delhi State’. What makes the situation in Delhi interesting is the fact that Delhi is a Union Territory i.e. administered by the Union but has its own State Legislative Assembly with a Chief Minister at its apex. The only problem is that Delhi is not a state. Even though all the major political parties, at some point have demanded statehood for Delhi usually around elections, it is not a fully functional state. This makes one wonder as to what should be done to ensure smooth functioning of Delhi and if there is any solution for the capital at all. Article 239AA of the Constitution of India sets up the administrative office of the Lieutenant Governor, who is appointed by the President as the Chief Administrator of the Union Territory (or the National Capital Territory) of Delhi. The NCT also has its own state legislative assembly with a Chief Minister at its apex. All the powers mentioned in the State list are vested in the office of the Chief Minister except the control over public law and order, the state police, the state treasure trove, jurisdiction over matters mentioned in the state list. This has resulted in the power clash due to the existence of two different power centers simultaneously in Delhi. And this seems to be just the tip of the iceberg of the administrative snag in Delhi. Interestingly, the NCT itself is not autonomous, well, at least not politically and geographically thanks to the National Capital Region Development Board (NCRPB) Act in 1986. The NCRPB was created to address the population strain on the administration and the entire NCR Region is presently being administered by four different state governments and the Union Government. On top of shared responsibility of administration, the task of resource management and development of the capital is in the hands of three units: Delhi Development Authority (DDA), Public Works Department (PWD) and Municipal Corporation of Delhi (MCD), all of whom pretty much work independently without any mediatory organization in place. All of these factors have lead to some obvious mismanagement and confusion. This leads to the question that should the fate of 16.9 million citizens (as per Census of India, 2011) be left struggling with political ambiguity? There has been a lot of talk about Delhi obtaining statehood and giving full control to the state legislative assembly which seems feasible as the state legislative assembly is elected by the people of the territory and hence is more sensitive to the needs of the people than the Union Government. The Police should be answerable to the state legislative assembly as they are responsible for upholding public law and order in the area administered by the assembly. Lastly the central government has an unprecedented say in the administration of the NCT which itself does not bode well with the federal structure of the country. Yet we cannot deny that the situation of Delhi is unique in every aspect and the option of an independent statehood is not on the cards at least in the near future. After all, Delhi is the administrative center of the country. It houses the office of the President, the Prime Minister, of all the foreign dignitaries, the Supreme Court and the Parliament all of which requires optimum administrative discretion to function securely. This is not something that a State Government alone may be equipped to provide consistently. And being the Capital, Delhi should reflect the best the country offers and hence it needs to be administered by the Union. The heterogeneous nature of NCT’s population, due to people coming here from all parts of the country, is another reason why the maintenance of law and order should be done by the Central Government rather than by the State. So if not autonomous statehood then what is the alternative for solving Delhi’s apparent administration crisis? There is always the option of relocating the Capital as it will accelerate the development of that territory where it is relocated. However, since Delhi itself was the shifted capital from Kolkata in 1911, this is clearly not a permanent solution. Another option is to let the state governments absorb the NCR districts. But then again, NCR is required to diffuse the population growth in the NCT. Another unconventional stance could be that the nucleus territory in NCT where all the union offices are located (mainly the NDMC) should be declared as Capital and rest of the NCT should be given the full statehood of Delhi. However, this will require the setting up of additional agencies and committees which is the major cause of the problem in the first place. Another option can be to create an equilibrium or balance of power between the Center and the State. The State should have a say on the matters that directly affect the people living in it as long as it doesn’t disturb the national character of the NCT. The Indian Parliament has always efficiently delivered to the unique needs of different states. It should therefore not be much of a hassle to create a special legislation for Delhi that provides for the ‘Delhi State’ to work for the welfare of its people without unreasonable restrictions. Whatever the outcome of this tussle may be, Delhi still have a long way to go to achieve political stability. The fate of the National Capital Territory is still undecided. Meanwhile, it is necessary to evaluate the consequences this tug of war has on the development of Delhi as a political, economical and sustainable urban niche. Diyangna Sharma is pursuing a degree course in Political Science at the University of Delhi. She is an avid reader, keen debater and can talk about anything from politics to the latest season of Suits. NextUrban Innovation Challenge: Have You Submitted Your Idea Yet? They are digging road in Tilak nagar..and it is a mess after the rains. and no agency is coming forward to do any damage control today. The article is with the facts and I agree with the writer that the Delhi and for that matter entire NCR should be under central control. A well researched, well written article! I’m highly impressed by the author. She has given due consideration to both the sides of the argument and presented it well along with the solutions. The administrative mess in Delhi is certainly weighing heavily on the common man, what with the garbage disposal tussle or delay in important infrastructural projects. The LG and the CM need to stop locking horns over every issue.
. Delhi certainly deserves to be given a special status and political treatment. But in my considered opinion, the so called political crisis is more of a cloak to divert the people’s attention from the failure of the current state government ( in achieving it tall promises). Must say that a good investigative analysis has been made by the writer esp the possible solutions. A comprehensive and factual article. It gives realistic way to run Delhi administration as Delhi is the capital state of the country. Well presented the norms and the solutions.Political stability is not just the single handedly operated organisation’s target,if can be distributed among the state or the central it will be needed to work as the union not the sub organisations whether its Delhi or NCR districts. Very well presented, stating clearly the pros n cons of all options and alternatives. The writer has succesfully managed to objectively present the basic loopholes in the current situation, without a bias towards current or previous political parties. Good projection of current political scenario of Delhi/ncr with all possible ups and down. Indeed a well articulated reflection on the ongoing tussle to administer Delhi….author’s keen understanding while at the graduation level is commendable….I feel that, this time such a tiff is greater than ever before, because of looking for a one-up-manship phenomena in every issue whatsoever…wherever…by the Aam Admi founders. Such people are showing a habitual inkling towards negating anything that present Central government does. This is unfortunately, an extremely rotten politics as a result of which all development, growth and civic administration suffers grossly. Leave aside full statehood…Delhi does not deserve any Assembly elections and should therefore be controlled by LG/Central government through Municipal Councils who are elected representatives of the residents of Delhi anyway. Very well written article.good projection of current scenario…. Good going. Article sheds the right light on the current political scenario. Good job. Very nice article Divyangana.. Keep it up… May GOD bless you with HIS grace and kindness kindness kindness…. S. Congrats..